But, its boring. Yes, sort of. If you are the type who has to have something colorful and exciting then I suppose they are sort of boring. Fiestaware or something might be your choice. But for me I like the simplicity of white. Since you can find them anywhere they are very easy to replace. The five year old dropping a plate will not be a tragedy. White also makes for easy cleanup. Even a young child can learn to wash a dish. Unadulterated white makes it easy to see that a through job has been done. On the flip side I love fine china. There is something really nice about having dinner on fine plates. I have three patterns that I collect when I have the chance. These are items that bring a good deal of pleasure to me, one set has been handed down from my father’s mother and the other are just two sets I love. My hope is that my daughters and granddaughters will also love them. But for everyday use nothing beat those nice little white stoneware dishes. You can find other great “Works for me ideas” at Shannon’s blog Rocks in my Dryer. Such a great idea. I love white dishes because you can dress up your table any way you like with linens and such, and your dishes will still match. Thanks for the comments. 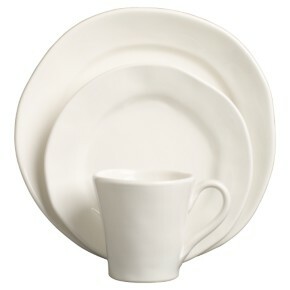 Colin Cowie (he’s some fancy designer) always uses white dishes. Then he dresses the table up with colored glasses, napkins and candles. I switched to white dishes awhile ago. I love them! Your table can look however you want it to–all you need to do is change the linens, glasses, etc. I love my simple white dishes and have used them for years. They never get old. When I do feel like being a little funky I have a simple set of red dishes, too. I *love* my white dishes! They go with absolutely any occasion, and actually dress up everyday ones!! When these are all broken and need to be replaced, I’ll be buying another white set. If I have to buy dishes again…this is the way to go!! You are currently reading Works for me – Simple White Dishes at Simply Catholic.